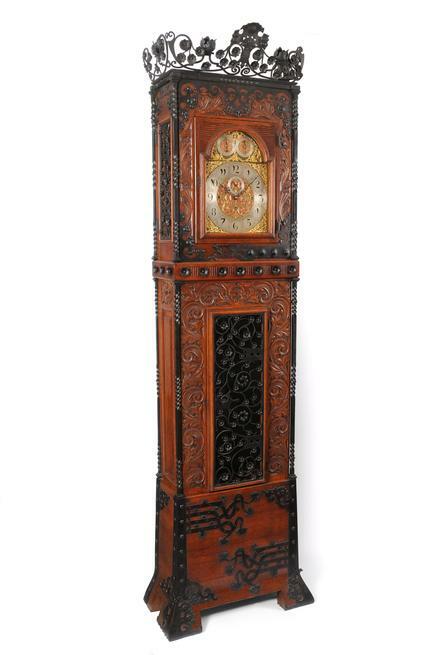 This impressive clock is a rare example of a fully developed early Arts & Crafts or Aesthetic movement hall clock. The unique nature, large scale and extensive use of hand crafted ornamental embellishment suggest that it was produced as a special order or commission. 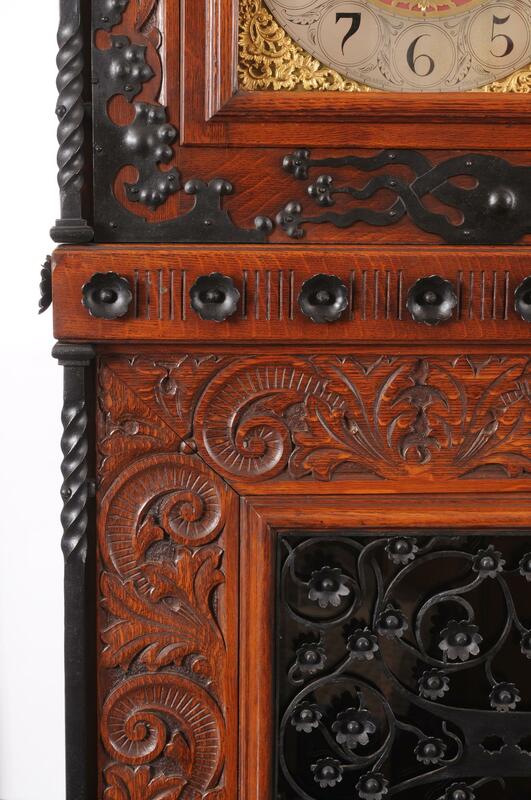 The carved oak case is decorated with wrought iron strapping, open floral scrolled galleries and twisted iron columns. Portions of these treatments are identical to metalwork found on a related clock produced for the Veterans Room here at the 7th Regiment Armory. The clock incorporates a very special dial featuring a chapter ring decorated with wonderful “Arabesque” numerals, which advance the overall aesthetic of the piece. The dial is inscribed with the name of the upscale Philadelphia retailer, Bailey, Banks and Biddle. It includes subsidiary dials in the lunette, with selector hands to control the chime/silent function and the chime choices. The precision “three-train” brass clock movement plays Doncaster chimes on a rack of eight bells or Westminster chimes on four coiled gongs. It runs for a duration of eight-days on a winding and includes a deadbeat escapement and maintaining power, features reserved for only the finest movements. The works are attributed to the London clockmaking firm of J. J. Elliott. This firm produced high quality movements of this precise configuration, many of which were made for export to the American market. During the late 19th and early 20th Century, many fine American clockmakers and retailers, including Tiffany, incorporated Elliot movements in their finest clocks. 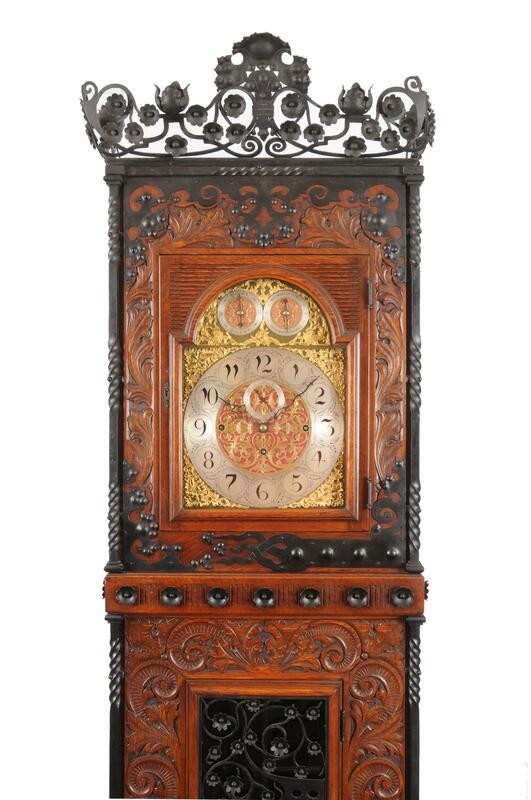 By adjusting the chime selector dial, the clock can be set to play either Westminster or Doncaster chimes. It also strikes the hours on a separate larger gong.